The will of Richard Price, vicar of Drayton, left funds for the creation of Drayton's first workhouse. The workhouse was establsihed in 1772 on Shropshire Street and enlarged in 1788. A parliamentary report of 1777 recorded parish workhouses in operation at Drayton in Hales for up to 75 inmates and at Hodnett for 20. County of Stafford: Tyrley — Parish of Drayton Hales, Mucclestone. Later Addition: Ashley (from 1837), Market Drayton (from 1914), Sutton-upon-Tern (from 1914), Tittenley. The population falling within the union at the 1831 census had been 12,999 with parishes ranging in size from Norton in Hales (population 311) to Drayton in Hales (3,882). 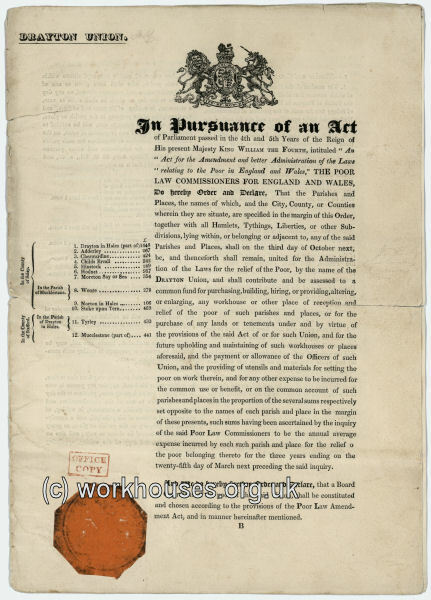 The average annual poor-rate expenditure for the period 1834-36 had been £5,598 or 8s.7d. per head of the population. Document from Poor Law Commissioners detailing the creation of the Drayton Union, 1836. The main building had a T-shaped plan with a large octagonal hub containing receiving wards to the front and Master's quarters to the rear. The west wing contained a boy's day school and able-bodied men's day rooms, with dormitories above. The east wing contained equivalent accommodation for women and girls. The north wing contained the kitchens. Blocks for aged paupers and isolation wards were at the rear. Plans from 1899 show a proposed infirmary at the north-east with a two storey central portion and single storey wings at each side. It included a nurses' room and a lying-in ward over the centre. After 1930, the workhouse became a Public Assistance Institution known as Quarry House. The former workhouse buildings have now been demolished and a housing estate now occupies the site. Shropshire Archives, Castle Gates, Shrewsbury, Shropshire SY1 2AQ. Please note that records may contain gaps or have access restrictions - please check before visiting. Limited holdings include Guardians' minutes (1836-1930); Ledgers (1836-1930); etc.